Wear-Ever pots and utensils have played an important role in North American cuisine, and one unexpected way is in the making of applesauce. 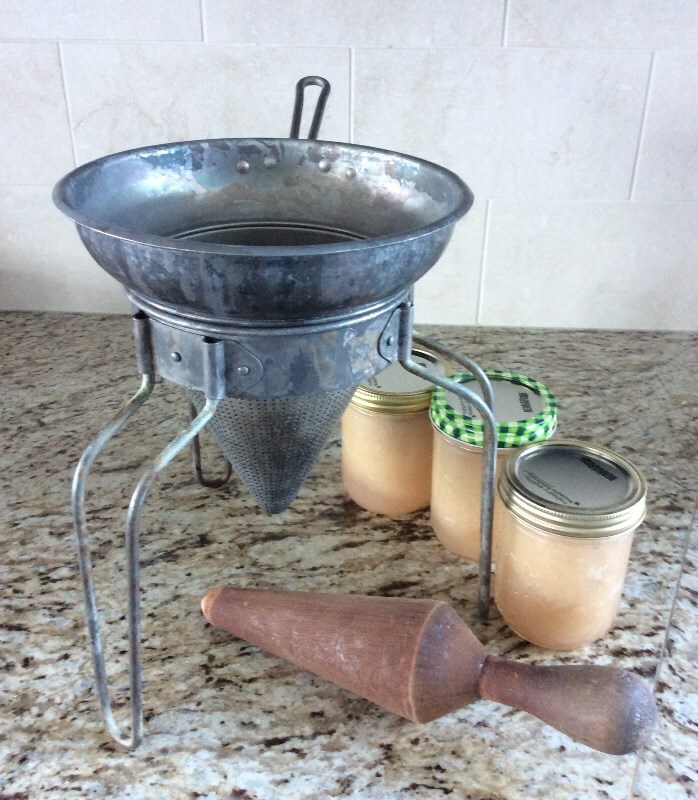 A few years ago I was visiting a friend and she was making applesauce to preserve for her grandchildren. “So much work,” she complained, “all that peeling and coring.” I said to her that I probably would never make applesauce if I had to do all that work and I explained to her how I make applesauce the way my mother (and probably a lot of women in North America) did who bought Wear-Ever pots and utensils. 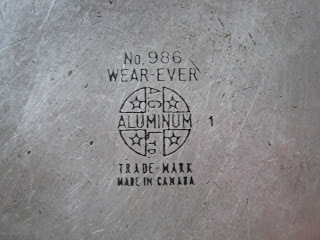 These aluminum products were marketed by door-to-door salesmen across Canada and the United States, although in Canada they could also be purchased from Eaton’s catalogue[i]. 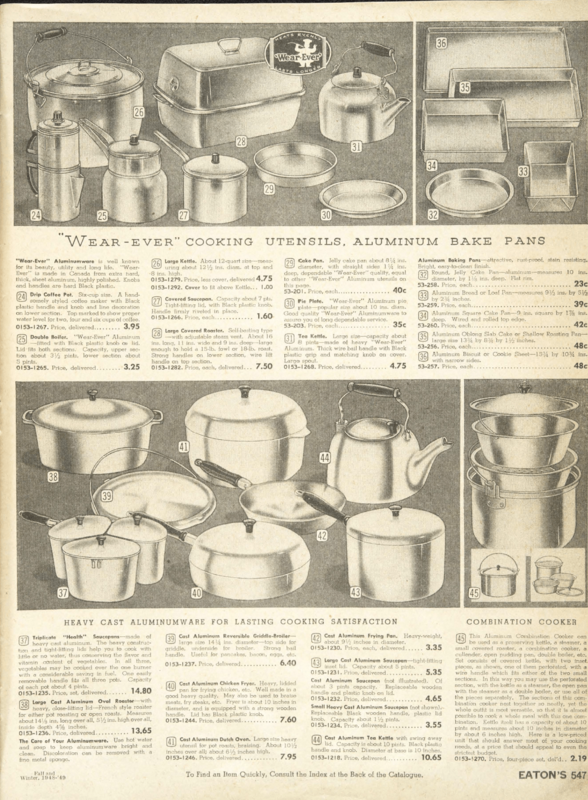 By the 1940’s Wear-Ever accounted for more than 40 percent of the aluminum cookware business in the United States. I imagine it was about this time that my mother bought the Ever-Wear cooking utensils that were in our home until a fire destroyed much of it. 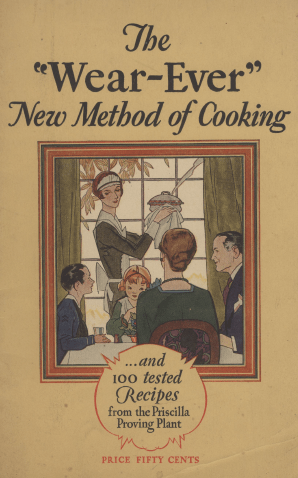 Wear-Ever products were marketed as “the new method of cooking”. 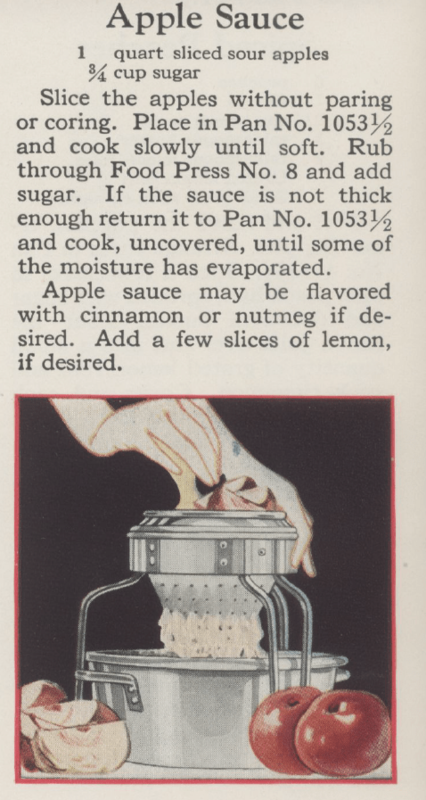 A US pamphlet circa 1930 titled Wear-Ever Aluminum Specialties states, “The purpose of the “Wear-Ever” New Method of Cooking is to cook foods without loss of natural flavors and valuable mineral elements”[v]. The emphasis was on “water-less” cooking as a way to retain the nutritional value of the food. The Wear-Ever cookbook shown here says “A large part of the mineral contained in vegetables and fruits lies directly beneath the skins. Avoid peeling these foods whenever possible”. I basically follow this method but I will sometimes add a small amount of water to the pot to prevent scorching on the bottom. Once you put the apples through the food press only the peels and bits of core are left, so there is little waste and a lot less effort. Here is my mother’s Food Press No. 8 with the applesauce I prepared in it to be preserved this year. It has been well used and even survived the house fire!